Squidward: (sighs in bliss) You may speak. SpongeBob: Patrick and I are going to see Fisherman 4. Squidward: Ha, you two won't sleep a wink tonight if you see that movie. SpongeBob: Squidward, you are looking at two very grown-up big boys. SpongeBob: We'll show Squidward, we're not afraid of any old movie. SpongeBob: I wish we had a flash light. SpongeBob: Gee thank you sir. Ooh the movie's starting. SpongeBob: Sorry. (On screen there are kids on a playground. Two of them are titter tottering.) Oh this isn't too scary. (Above the two children, we see a boat with a hook in the water.) The Fisherman's hook! Get off the titter totter! Patrick: And he'll fry them into fish sticks. I can't watch. Is the scary part over? SpongeBob: Uh hold on I'll take a peak. Guy Fish: Thank you for meeting me Edweena at midnight. Patrick: You sure? Aaaah! It's worse, they're kissing. Guy fish: I love you Suzy. Guy fish: I'll never leave you Jennifer. (He gets hooked in the pants and gets dragged up to the sky.) Good bye Margret! SpongeBob and Patrick: The Fisherman! SpongeBob: Sorry, sorry, sorry sorry! French narrator: Two hours later. Patrick: See if it's safe. SpongeBob: Aw the movie's over. Patrick: Aw dang, we hardly even saw it. SpongeBob: Well we'll watch it again and this time all the way through. 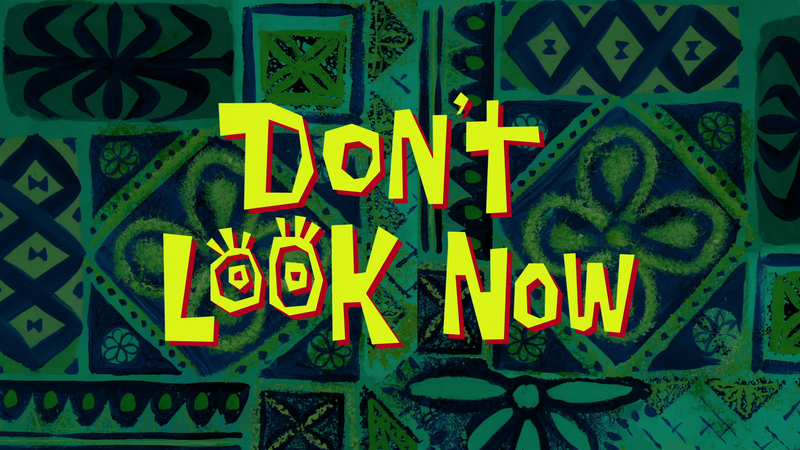 SpongeBob: Okay keep your eyes open. Boy #1: I love eating ice cream. SpongeBob: Patrick I'm getting scared. Hold my eyelids open. Boy #1: Hey my ice cream. Nooohohohoo! (sobs) It was rocky road! Patrick: Ah I can't hold your eyelids, they're too slippery. SpongeBob: Aw, we missed the movie. SpongeBob: It's okay we'll just see the next one. Anglerfish: I'm afraid not, that was the last showing. SpongeBob: Wow uhwha- what time is it? Anglerfish: It is one minute to midnight. SpongeBob: One minute.. to midnight?! Patrick: But that's when The Fisherman comes out! SpongeBob: Come on Patrick, we gotta get home. SpongeBob and Patrick: Aaaah! The Fisherman! SpongeBob and Patrick: It's midnight, The Fisherman! SpongeBob: Phew, we made it. Patrick: I guess we showed that old horror movie who's boss. SpongeBob: Yeah we looked fear right in the face.. and avoided direct eye contact with it. Patrick: It's like we're heroes. SpongeBob: Okay Patrick sleep tight, I'll see you tomorrow. Patrick: Wait a second. You mean I have to walk all the way home alone? SpongeBob: No, no you don't. I'm going to walk you to your door. Patrick: Darn old horror movie, why couldn't we watch a cartoon instead? Patrick: Do you hear that? SpongeBob: I think it's coming from over there. Patrick: Okay, come on now. Don't be all ascared, I'll walk you home. SpongeBob: Oh thanks old pal, but then who's going to walk you home? Patrick: Let's just cross that bridge when we burn it. Squidward: What is wrong with you?! Squidward: What are you blockheads up to? Don't you know it's after midnight? Get down here. Patrick: We can't get home. SpongeBob: We're too scared. (The scene changes to Squidward carrying both of them. Patrick on his back and SpongeBob on his head.) (sighs in relief) Thank you Squidward you are a true friend. SpongeBob: Yeah thanks Squidward I don't think we would have ever gotten home without you. Squidward: I told those mutton heads not to see that movie. SpongeBob: (from his own house) Patrick are you okay? Patrick: (from his) Yeah are you okay? SpongeBob: I think so, g'night. Patrick: Yeah g'night, just don't think about The Fisherman. SpongeBob: Oh no I will not think about The Fisherman. Sleep tight. Squidward: Oh The Fisherman, The Fisherman. Blah blah blah. They want a Fisherman eh? I'll give them a Fisherman and how. Patrick: Uh hello? Someone there? (The hook goes into one of his nostrils.) Uh huh? What that? What heh, it's something stuck um huh. (The hook jags him.) Oh wait a second, oh yeah that's the spot. A little to the left... oh yeah, alright. Right there. Ahahaha. Patrick: SpongeBob! SpongeBob wake up, he's here! Patrick: Oh (Patrick puts another face on.) there. Patrick: Oh yeah uh, The Fisherman's here. SpongeBob: Ah The Fisherman's here! Squidward: Hahaha! Listen to those nonicks, what a couple of hopeless babies. I really should stop, but I'm having too much fun. (He opens the door.) Heh, it's almost too easy. Squidward: There's just no sport to it. SpongeBob: Do you think it'll hold? Patrick: I sure hope so. Patrick: Maybe if we don't look at it it will go away? SpongeBob: Oh yeah just like the movie. Squidward: I'm the deadly Fisherman. SpongeBob: Well I guess this is the end old buddy. Patrick: I don't want to die in my underwear. SpongeBob: Here (He rips them off.) die in mine. SpongeBob: And here you go. Where were we? Oh yeah. Both: Aaah! He's going to turn us into fish sticks! SpongeBob: That thing's eating Squidward. Patrick: Not out bestest buddy, we gotta save him. Okay plate 33, I need you to go along. And... break! You're going down Fisherman. SpongeBob: Don't worry Squidward, we'll get you out of that old monster. (SpongeBob tries to walk away with Squidward's head.) Let's escape through the window. SpongeBob: Okay I think you've got it. SpongeBob: Shh shh, no need to thank us. We were only doing what any good friends would do for their bestest buddy. Well I guess we don't have to worry about that old monster anymore.